A holarctic genus with its main diversity in Europe, Russia and North Africa. The cladogram is based on Kodandaramaiah and Wahlberg (2009). 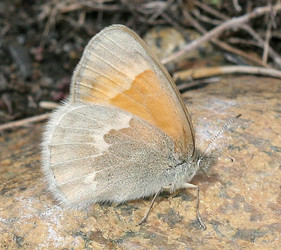 Note that Coenonympha tullia s. l. is polyphyletic according to this study. More sampling of the diversity of North American geographical races/subspecies is necessary to corroborate this hypothesis. Bozano, G.C., 2002. 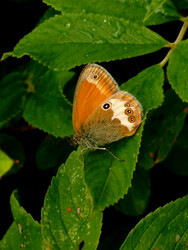 Guide to the butterflies of the Palearctic Region. Satyridae part 3. Tribe Satyrini. Subtribes Melanargiina and Coenonymphina. Omnes Artes, Milano. 71 pp. Kodandaramaiah, U. 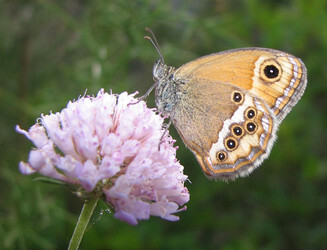 & Wahlberg, N. 2009 Phylogeny and biogeography of Coenonympha butterflies (Nymphalidae: Satyrinae). Systematic Entomology 34, 315-323. Page: Tree of Life Coenonympha Hübner 1819. Authored by Andrew V. Z. Brower. The TEXT of this page is licensed under the Creative Commons Attribution License - Version 3.0. Note that images and other media featured on this page are each governed by their own license, and they may or may not be available for reuse. Click on an image or a media link to access the media data window, which provides the relevant licensing information. For the general terms and conditions of ToL material reuse and redistribution, please see the Tree of Life Copyright Policies.